One of the greatest hazards Paraglider pilots face is getting blown behind a ridge or mountain. Once you get into a blow-back situation, the penalties include power lines, extreme rotor turbulence, tree landings, and possible death or injuries from any of these. Prevention is the best way to avoid such a scenario. Avoiding launching on windier days is a good practice, but blow-backs occur from other situations and factors. At some sites, the launch is at a lower point than an adjacent cliff, ridge, or mountain and there can be a great difference in wind speed between different levels. In addition, the wind can change velocity at any time after you have launched. This article provides techniques for managing wind increases and what you can do to prevent a blow-back at different flying sites. Regardless of whether you fly mountains or ridge soaring sites, the techniques for managing and monitoring winds speeds are similar. Primarily, you need awareness of the wind speeds when you launch and continual monitoring of the wind speed as you fly. If you ascend, there are often stronger winds aloft. The key to wind management is to continuously monitor the wind for changes in speed. Prior to launching, check to make sure the wind speed is within your ability level at the site you are flying. I have learned over time that it is far better to use the more objective tool of a wind speed indicator, as it is simply too difficult to tell with the feel of your skin. It is also important to gather site information. Are there any venturis to be aware of? Are there locations near the site where the wind tends to be stronger? What is the day's forecast and what are the locals saying about the day? If you are not in the habit of gathering this information before you fly, it is time to start. It should go without saying that if your glider has a speed system, always fly with it ready for use. This means that the speed system is correctly adjusted and connected properly. If the winds were light at the time of take off and later they increase to the point where the speed bar is needed, there will not be time then to hook it up. · Your Crab Angle will need to be increased. · Your ability to traverse parallel to the ridge will decrease. Keeping tuned in to these two factors at all times will help you manage wind increases. At some ridge soaring and some thermal sites, you will launch at a point well below higher cliffs, ridges or mountains. When ascending from the lower ridges/cliffs to the upper ridges/cliffs, you must continually monitor the wind speeds and your ability to penetrate. It is best to stay further in front of the cliffs when it is moderately windy or strong conditions. When ascending at a ridge or cliff, pad your distance more and more from the cliff as you fly higher up the cliff. If the wind increases suddenly at a higher level, this extra distance will aid you in getting back below the stronger winds and keep you in front of the increased winds that are at the top of the cliff. Never fly above and behind the high cliffs, it just is not a good place to be. 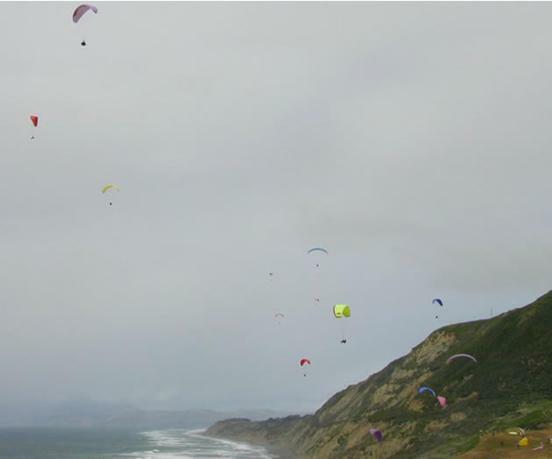 Notice that the gliders in the below photo stay out further as they fly higher. When your crab angle is increasing and you need to point more into the wind, you are being warned that the winds are getting stronger. If you notice that it is getting strong and your ability to penetrate is being compromised, take action right away. As you rise higher, there is normally more wind. It is the awareness of these wind signs that will keep you out of trouble with blow-backs. When you become aware that the wind is blowing stronger, fly immediately upwind away from the cliff and descend to winds in which you will have better penetration. Point straight away from the cliff, ridge or mountain and combine the use of your speed bar and Big Ears to achieve the combination of descent and speed. If the wind is not straight in, there is not much difference. For example: on a day when the wind is blowing from the Southwest (on a west facing ridge), better penetration can be achieved by pointing straight away or slightly toward the Northwest. If there are smaller cliffs to the north, this will serve as beneficial. Adjust this angle to find the one that gets you away from the cliff the best. At thermal sites, it's necessary to adjust where you can fly (above or behind a mountain, cliff or ridge) based on how much wind there is. On a very light day, you might be able to drift with a thermal at a 1 to 1 angle above and behind the ridge. On a day with manageable winds above 10 MPH, it is much better to fly no further back than the top of the mountain. If it is so windy that you begin losing penetration above the mountain, you have already flown too high! When you learn to gauge the wind-speed using these techniques, you will better be able to make adjustments when getting higher and before it becomes critical. Using the speed bar alone will help you penetrate the wind, but a better approach is to fly well below winds where you would ever need to use it. If you have the padding in front of a cliff that you should have, the speed bar will almost always give you 5 + MPH of extra speed. Once you decide you need to get on your speed bar, if you can penetrate without climbing, you may be able to take care of the situation without using Big Ears. But, there are times where you are penetrating with the speed bar, but still climbing. Remember, the higher you go, the stronger the winds will likely be. Whenever the situation is getting critical, the combination will work best. At any site, ridge soaring or thermal, the wind just above and behind the top of the mountain or top of the ridge will increase 5 - 7 MPH on a windy day due to a couple of factors. The above illustration shows a side profile of a ridge soaring site. Although this picture depicts a coastal site, the same principal is true at any site where there is dynamic ridge lift. Remember that air has weight. 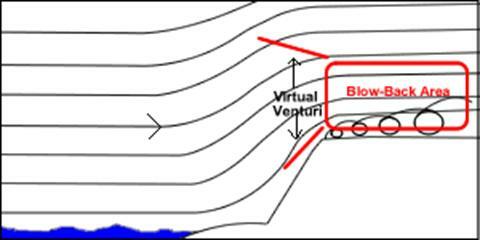 The combination of the upward moving air and the weight of the air above that the deflected air is pushed into creates a virtual venturi above and behind the cliff or ridge edge. A venturi causes wind speed to increase. A larger volume of air is trying to fit through a smaller area and the only way it can is to move faster. On a windy day, you will see your ability to penetrate go down about 5 - 7 MPH above and behind the cliff, ridge or mountain. There are two causes for this 5 - 7 MPH wind increase. One is the virtual venturi I just described. 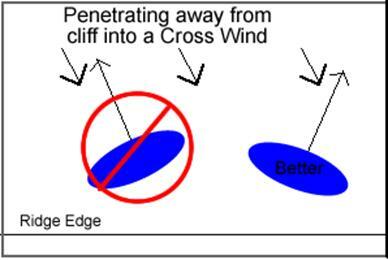 The second is transitioning from the rising air in front of the cliff or mountain into the horizontal winds above the cliff will result in reduced penetration. When you fly in front of the cliff, your wing will not see the full force of the wind. Your wing's penetration is only related to the horizontal component of the wind's speed. Since the wind in front of the cliffs is deflected up, wings are better able to penetrate there. Once the wind rounds out and moves horizontally above the cliff, or ridge, the wing will lose the extra penetration because the horizontal change in the airs movement will decrease your ability to penetrate. No matter what speed the wind is blowing, you will have a slower ground speed (lower penetration) behind the rising air in front of the cliff or ridge. On a strong day, if you reach a point of not penetrating right in front of this area, you are a prime candidate for getting blown back. Regardless of whether or not you got into this predicament using your speed bar, it will likely not help now. The reduced penetration in this area could exceed the extra speed you get from the speed bar. The key point here is that drifting back into this area on a strong wind day is risking your life! There are plenty of warning signs, like your crab angle and low traversing speed that warn you that the wind is getting too strong for your current location. So, you ask, "What if I am above a ridge and not able to penetrate back in front. What should I do then?". Well, that is a main reason for this article. It gets real tricky and there is no way to cover the myriad of possibilities for such a scenario. The answer would vary based on the site, hazards and degree of the situation. One option for the above situation (at some sites) might be to fly downwind of the mountain if there is a safe area to land and the LZ can be reached without flying through a rotor. As I stated at the beginning of this article, prevention is the best way to avoid these consequences. Being afraid of being blown back and taking action prior to putting yourself in such an ominous position is the best prevention. · If you are new to a site, get a full introduction from the locals. · Check the Wind Speeds with an anemometer before you fly. · Have a speed system ready on your glider. This means connected, adjusted, and ready for use. · Know that the winds can be dramatically stronger and dangerous as you ascend at any flying site. · Continuously monitor the wind speeds as you fly. (Do this via your crab angle and lateral groundspeed along the ridge). · Avoid flying higher on windy days. · If you do fly higher in strong winds, fly well upwind of the cliffs as you ascend and traverse the cliff or ridge. · Know how and when to penetrate out in front and how to descend to lower winds. · Penetrate and get down as soon as you notice that the wind is getting strong. When you get on your speed bar, your purpose should be getting down, not staying up in the strong winds. · Avoid the area above and behind the top of the cliff at all times. Jeff Greenbaum began flying Paragliders in 1988. From 1988 - 1997 he was owner of Airtime of San Francisco, then resumed using the name in 2004. Jeff is an Advanced Paragliding Instructor, Observer and Tandem Instructor.